Statistics reveal the structural decline in private employment but do not capture the causes. By looking at non-seasonal data, one avoids the machinations that the BLS does with adjusting for seasons. One can simply compare month to month to achieve a view of seasonality. After the dot com bust and 9/11, the resulting recession bottomed out for jobs in 2003 and started recovering in 2004. Currently, the officials and experts are saying 2009 is the bottoming out year of the current recession and 2010 as the first recovery year which would be comparable to 2004. This chart compares the number of jobs each month for the previous recovery to our current 2010 recovery. The problem is that the 2010 slope line has not gained on any of the years of the previous recovery. If the 2010 slope line continues to form, that is, not gaining on the other lines, we may have to conclude the new normal is significantly fewer jobs. Thank you, David, for an eye-opening chart. According to the U.S. Census Bureau estimate, the population of the U.S. is almost 310 million residents. 1. The 35% of the population working in the private sector supports the entire populace of 310 million. It could be argued that government employees also pay taxes and thus help support non-employed residents, but I suspect that government-paid benefits and lifetime pension pay-outs exceed the total taxes paid by government employees, so ultimately the entire burden for both non-employed and government employees falls on the private workforce of 107.8 million. 2. The 2.6% of the populace engaged in agriculture grows the food for all 310 million residents plus uncounted tens of millions of people overseas via agricultural exports. 3. Only 45% of the civilian noninstitutional population is employed in the private sector. 4. About 18% of the employed "officially" work for government at some level (Federal, state, local), but the number of people indirectly paid by government funds is much higher. If we include the "private sector" employment which in essence works for the government via contracts (the entire Defense industry, etc.) or grants (National Institute of Health and National Science Foundation grants are the ultimate funding source for most university labs engaged in "basic scientific research"), all others employed via grants and/or contracts from government agencies such as DARPA, Education, Department of Energy, Homeland Security, etc., then the number of those directly or indirectly paid by government is much larger. My guesstimate would be 25% of the nonfarm employed (131 million) get paid by government agencies, contracts or grants. Paychecks from private business shrank to their smallest share of personal income in U.S. history (41.9%) during the first quarter of this year, a USA TODAY analysis of government data finds. 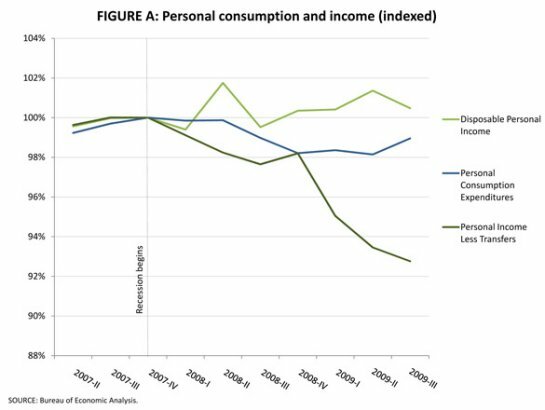 Note that personal income fell 6% or so since the start of the Great Recession and continues to slide. 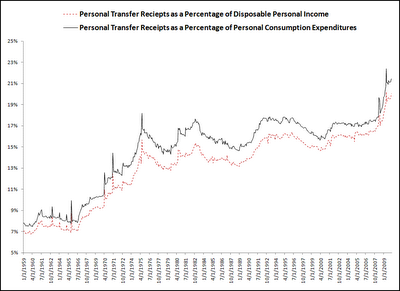 Personal expenditures rose because the Federal government borrowed $1.6 trillion each year and distributed it in various ways, including direct transfers of cash, which have risen as a percentage of personal income. We should note that these transfers are cash, not benefits: thus the $450 billion spent on Medicaid healthcare for low-income residents is not a transfer payment. In other words, hundreds of billions of other taxpayer dollars also flow to residents, above and beyond transfers of cash. Here is my question for all pundits pontificating on employment: have you ever started a business and employed five or more fulltime employees? I suspect that 99% of all pundits, academic or otherwise, commenting on employment trends have zero experience in starting a business and hiring/managing employees in the real world. I say "five employees" to eliminate academics who hire one graduate student for part-time assistance (having a nanny also doesn't count). Here is the key reason for that minimum: having at least five employees introduces you to the ongoing living nightmare of supervision and other "human resources" tasks. With at least five employees, you will experience the joys of weekly FICA deposits (Social Security payments). You will realize the government doesn't care if you can pay yourself or not; you must pay your employees' taxes until the moment you declare bankruptcy and lay them all off. You will also experience the sleepless nights which go with having to raise $10,000 a week in revenues just to keep the doors open, never mind pay yourself. You will also experience the burden of keeping track of the multitude of taxes/costs you must pay on each employee: not just Social Security, but withholding taxes, temporary disability, unemployment, workers compensation, etc. You will also be liable should you fail to comply with an untold number of other regulations: safety, labor law, reporting required by government contracts or use of government related funds such as an FHA loan, and so on. If you live in a state which requires employers pay at least part of employees' healthcare insurance, you will have to acquaint yourself with the complexities of the new healthcare bill, lest you expose yourself to some future liability or legal claim. There is a weird disconnect between the experience of being an employer who actually hires and manages employees, and those who are employed or not working. The pundits love to speak in grandiose terms about employment trends; they love to extol the "dynamic U.S. economy" and offer other incantations disconnected from hard reality. So allow me to summarize the primary cause behind the structural decline in private employment: You have to be insane or a masochist to hire an employee in the U.S. today. There are exceptions, of course; if you and your college buddies just scored $10 million in "angel" funding for your social-media startup, then you are free to blow the money hiring your other buddies. You have enough money now to let others handle all the gory details. When the money runs out, you fold or sell out. The goal isn't to assemble a company which might last a decade or two; it's to get a product out, generate some buzz and then sell your startup to some big tech company. That is the thin slice of "new hiring" which is glamorized as reflecting "the dynamic U.S. economy," but as I constantly note, Twitter has less than 200 employees. If anyone thinks Twitter and its ilk will "save" the U.S. economy, they are engaged in a pleasant state of absolute disconnect from reality. If your business is growing revenues (and gross profit margins) so fast that a new employee can book five times their total compensation in revenues without breaking a sweat, then yes, hiring more people to handle the flood of new business is necessary. The number of businesses which qualify for these conditions is vanishingly small. Meanwhile, roughly one in three residents are faced with supporting the rest of the populace via taxes or interest payments on the trillions of dollars being borrowed and spent to keep the good ship Status Quo afloat. Is that sustainable? Please start a new business from scratch, hire at least five people fulltime, keep current on all the taxes and other costs, and then check in with us in two or three years. That experience will inform your answer. Thank you, John P. ($20), for your splendidly generous contribution to the site-- I am greatly honored by your support and readership. Thank you, Stephen K. ($25), for your superbly generous donation to the site -- I am greatly honored by your support and readership.